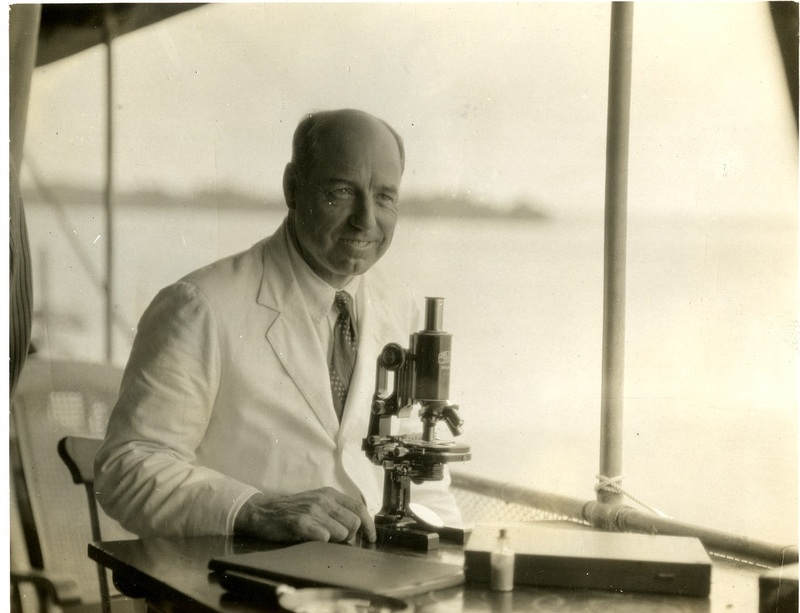 Richard P. Strong with a microscope on the Amazon River, ca. 1924. Image courtesy of the Center for the History of Medicine, Countway Library. Occasionally, the Center for the History of Medicine at Countway Library has an opportunity to address the preservation needs of older collections being stored in problematic housing. In the case of the Richard Pearson Strong Papers, 1911-2004 (inclusive), 1911-1945 (bulk), archivists recently took the opportunity to transfer 69 ft. of records from older, overstuffed, acidic manuscript boxes into spacious, acid-free, archival quality records center cartons. These important preservation steps ensure continued access to the collection over time, and also gave archivists a unique opportunity to provide additional context within folder labels to benefit future researchers. Richard Strong (1872-1948) became the first professor of tropical medicine at Harvard in 1913, and between 1913 and 1934 made several expeditions to South and Central America and Africa to investigate diseases and obtain material for his laboratory and teaching work. After retiring from Harvard in 1938, he volunteered to teach in the Army Medical School during the Second World War. During this period Strong was the foremost authority in the U.S. in the field of tropical medicine. Throughout his career he participated in many international commissions investigating disease control. The Richard Pearson Strong Papers are a popular research tool at the Center, with material ranging from Harvard teaching and departmental records, to expedition records such as diaries, notes, supply and equipment lists, and manuscripts of lectures and reports. His correspondence includes exchanges with Harvard associates, scientists, U.S. and foreign public officials, former President Coolidge, missionaries, and organizations such as the Rockefeller Foundation. Strong’s expeditions included visits to Peru (1913 and 1937), Brazil (1924), Liberia and the Belgian Congo (1926-1927 and 1934), Guatemala (1931-1932), and the Yucatan (1931). A 1934 film of the Harvard African Expedition, in which Strong investigates diseases and obtains material for his laboratory and teaching work, has been digitized and made available online through OnView here. Until recently, Strong’s collection was being stored in older, overstuffed, acidic boxes, which over time leads to deterioration and discoloration. Folder tabs with crucial contextual information had lost their adhesive and were falling off of their respective folders. Unnecessary metal accoutrements, such as paper clips and staples, contributed additional damage to fragile records. Reference staff also noted that the contents within each box had, over time, fallen out of their original order — likely due to the fact that the older manuscript boxes were too small to accommodate them. As part of crucial preservation efforts, Center staff took careful measures to rehouse materials, remove unnecessary paper clips and staples, and restore the original order of each box. Delicate fabrics, such as academic garments and banners, were folded with non-buffered tissue and rehoused in customized acid-free boxes. Staff also took the opportunity to add additional context (such as date ranges) to new folder labels, which will in turn provide better context to future researchers. Such important preservation steps ensure both the protection of the Richard P. Strong Papers and the availability and utility of these records to Center researchers for years to come. Earlier this year, staff at the Center for the History of Medicine undertook a preservation survey of Boston Medical Library (BML) material held at the Center. 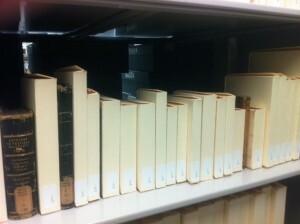 In March 2011, staff began by checking volumes against a shelf list of over 1,000 B MS b and 1.K call numbers (those which refer to bound or single item BML manuscript collections), selecting volumes in need of preservation, and measuring the selected volumes so enclosures could be ordered. Items were selected for rehousing on a “worst case” basis: volumes with ripped spines, loose covers, torn pages, or other clear damage such as degraded leather covers were selected first. Volumes which were in danger of being damaged – small volumes pressed by larger neighbors or volumes that could not sit evenly on the shelf due to irregular covers – were selected second. The majority of the 1.K volumes were already damaged or were being damaged by their neighbors on the shelf. The 1.Ks included volumes of diverse sizes that had been shelved together and were pushing each other out of alignment, leaning on each other, or shelved too tightly. 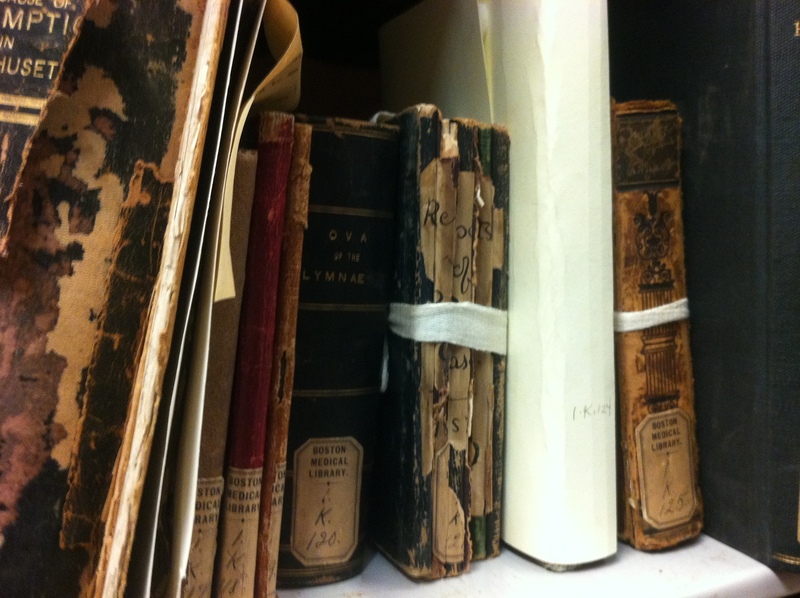 Many volumes were tied together with cotton tape or housed in insufficient enclosures; volumes were in danger of losing covers or spines when they were taken from the shelf. Some volumes had shifted out of correct call number order because the spine labels were missing, illegible, or in some cases because spines were missing entirely. Because of their condition, the 1.Ks were selected for rehousing before the B MS bs. The first 141 enclosures were ordered from CMI, a manufacturer of preservation quality archival enclosures, at the end of March. When the enclosures arrived, staff had finished the shelf survey of approximately 1,016 BML volumes and were cataloging items which had no record in the library’s catalog, HOLLIS. 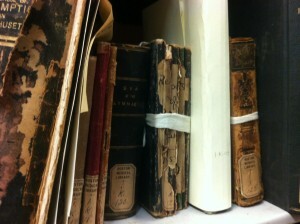 The project was then split between cataloging and rehousing volumes. Volumes were enclosed, relabeled, and replaced on the shelf in correct call number order. The shelves were cleaned as volumes were rehoused; old enclosures or tapes were discarded; and bookends were added to ensure volumes were properly braced. Over the course of the project from March to June, 468 enclosures were ordered and 202 volumes rehoused as described above. The cataloging project was ongoing with the rehousing through April, May, and June; Center staff created catalog records for volumes not on the shelf survey list and not in the library catalog. This process involved using original card catalogs as sources for new catalog records. If there was a card entry available, staff used it as the basis for a new record. If there was no card entry, a catalog record was created from scratch, determining creator, title, a physical description, summary, and subject headings from the volume itself. During the course of the survey, over 1,000 volumes were surveyed; over 200 rehoused; and new catalog records for 263 BML volumes are now available to users of the HOLLIS Harvard University Libraries catalog. Sketches of skulls from A Collection of Crania. While working on a Boston Medical Library-funded preservation project, Countway staff discovered a bound manuscript titled A Collection of Crania, copied from Pritchards [sic] Natural History of Man Illustrative of Campers [sic] Theory. The copyist was William Thornton Parker and the volume appears to have been constructed in 1847. 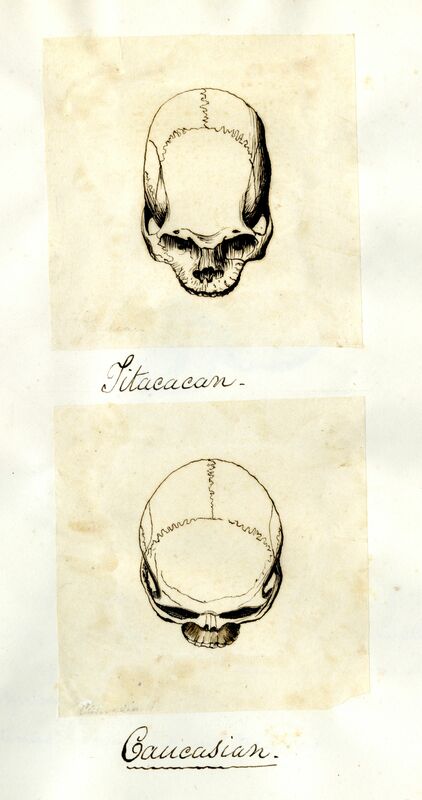 The bulk of the book is made up of copies of illustrations of skulls from various ethnicities, commentary on the drawings, and a single long excerpt at the beginning from Prichard’s The Natural History of Man (1843). Prichard’s book was intended as a popular history of the development of humans and the differences between humans living in different places. Petrus Camper’s theory, referred to in the title of Parker’s collection, was a mathematical method of describing human skulls by determining the angle of the front of the skull, roughly from the peak of the forehead to the jaw. The skulls Parker has carefully copied into his miniature collection come mainly from Africa, Europe, and Asia, including Caucasian, African, Chinese, and Mongolian examples. Almost every skull is accompanied by a description of the racial characteristics that some author – it isn’t clear if it was Parker, Prichard, or Camper – thought were important. By modern standards, the commentary is deeply racist with each skull described in terms of its similarity to “civilized” men, considered in this case to be Western Europeans. Women simply don’t enter into the argument at all. By contemporary standards, however, Parker was engaging with an ongoing and very modern scientific debate about the biological structure of humanity, the links between races and ethnic groups, and the development of humans as a species on Earth. Echoes of this scientific debate can be seen in eugenics policies like those imposed by the Nazi regime in Germany, illustrated in the United States Holocaust Memorial Museum’s Deadly Medicine: Creating the Master Race exhibition on display at the Countway Library through July 17, 2011. The Center for the History of Medicine is happy to announce that the audio recordings of the C. G. Jung Biographical Archive have been digitized and are now available to researchers. Previously accessible only in transcript form, the collection consists of 181 interviews with Jung’s family, friends, colleagues, and contemporaries. The interviews, which took place from 1968 to 1972, were funded by the Francis G. Wickes Foundation and were conducted by Dr. Gene F. Nameche. The collection was donated to the Francis A. Countway Library of Medicine in 1972. A mentee of Sigmund Freud, Jung was a leader in dream analysis and is credited with founding the field of analytical psychology. Due to restrictions set by the interviewees, some interviews are closed to access. In addition, access to the entire collection is restricted to onsite use only. For more information regarding access, please contact the Public Services staff. 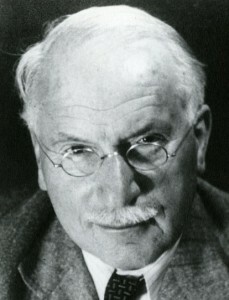 The digitization of the Jung Biographical Archive was supported by the Carl Gustav Jung Fund, created at the time of the collection’s donation to ensure its longterm research use and accessibility. 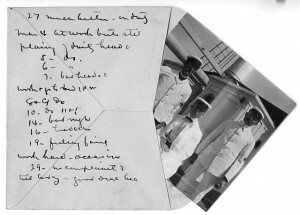 Annotated envelope and photograph of three unidentified men. The writer of the diary may be one of them. While conducting a Boston Medical Library-funded preservation survey, Center staff discovered a diary volume dating from the end of the nineteenth century. The writer notes life on board ship between New York and London and, later, London and South Africa, including the celebration of the birthday of Lady Randolph Churchill, one of the sponsors of the expedition and a fellow sailor. 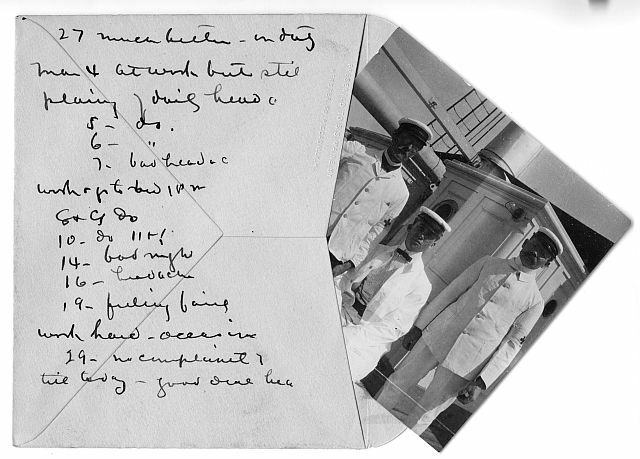 He also records, briefly, life in an Army barracks near London where the ship paused on its southward journey, noting the weather and any special events. During his time in London, the writer was an almost daily habitue of the theatre, although he does not mention which shows he saw. When on board ship, the writer almost invariably makes a daily notation of a distance he has run; presumably he was an onboard jogger, making so many circuits of the deck per day and wishing to record his progress. About midway through the volume, a small envelope containing a black-and-white photograph of three unidentified men, all in white coats, has been laid in. The envelope itself is covered in notes for diary entries. The writer does not include much about his work with the wounded – upon its arrival in South Africa, the Maine almost immediately received injured soldiers from the fighting around Spion Kop, including Lady Churchill’s youngest son, John. He notes that wounded are on board, but seems more concerned to record his impressions of South Africa, the celebrities who visit the ship, including many of the English military commanders in South Africa, and the ship’s movement from port to port. Unfortunately, it seems that the writer did not survive to return to America; the last entry in the journal reads: “Here ends abruptly the diary of [Otto Rinstrom]. On Saturday morning May 18th he was suddenly seized with a violent apoplectiform meningitis and died…” Despite the abrupt ending and the possible fate of the writer, the journal is a fascinating personal record of the South African war from the perspective of a non-combatant. 1. M. Eugenie Hibbard, “With the Maine to South Africa,” American Journal of Nursing, (1) 1900, 1, http://www.jstor.org/stable/i277779. Additional sections of the article were printed in later issues. 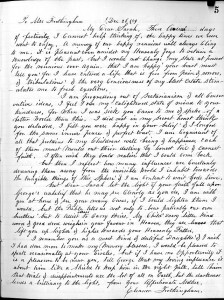 Letter from Eleanor Trothingham to her daughter, Boxing Day 1859. From the first volume of A Record of Spiritualistic Seances. During work on a Boston Medical Library-sponsored preservation project, staff discovered a manuscript entitled A Record of Spiritualistic Seances, transcribed by Mrs. Rachel G. Little of Boston, dating from the middle of the nineteenth century. The first volume of the Record opens with an index of “Personal Communications” from spirits to guests at the séances. Mrs. Rachel G. Little was the medium, providing space for these sessions at 39 Beach Street in Boston. The group met weekly “for instruction” at Beach Street. The first pages of the book provide a list of “spirit friends,” including several Reverends as well as ordinary men and women who spoke through Mrs. Little to those present at the séances. Numerous sessions are listed here, dating from 1856 through 1860. Transcriptions of spirit messages make up the bulk of the volume. Each is addressed to a particular individual and the spirits are identified by name and title, making each entry something like a letter. Messages come in from fathers, mothers, Joan d’Arc, and a Native American chieftain – Sagawatha, Chief of the Seneca, like Joan, an actual historical figure. 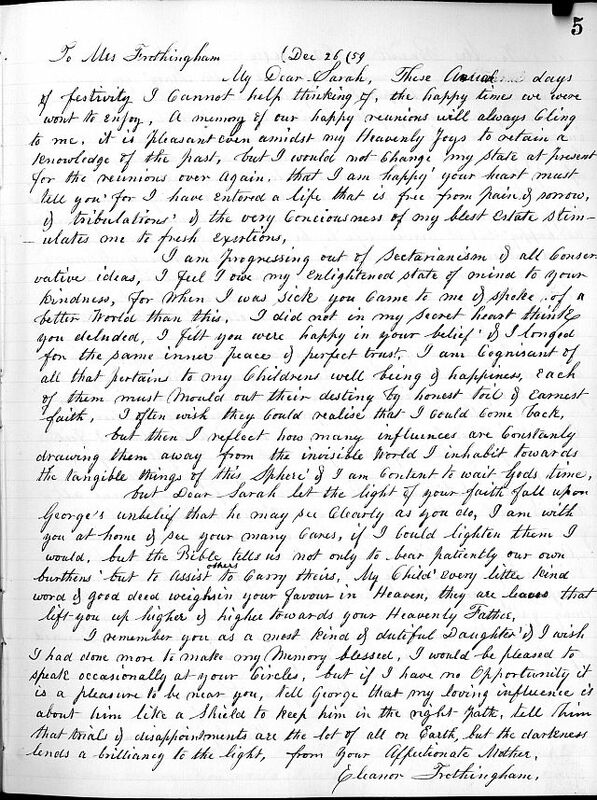 Sometimes the transcriber appended a note about the spirit, describing who he or she had been or done when alive or how the spirit had been connected with the living person. The messages from the spirits are fascinating to read. Many of them are strongly Christian in tone – note the presence of the Reverends among the departed! – and entreat those still alive to deepen their investment in the spiritual world while they await the “arrival” of the spirits. Most are generally positive, advocating deeper involvement in the spiritualist movement, congratulating the recipient on having an open mind to new experiences, and saying what delights await the living in the hereafter. While spiritualists were parodied, mocked, and debunked repeatedly by those who did not believe, the spiritualist movement endured beyond World War I and the existence of volumes like the Record show the strength and fascination of the possibilities the movement offered. 1Brandon, Ruth. Spiritualists: Passion for the Occult in the Nineteenth and Twentieth Centuries. New York: Knopf, 1983. Photograph conservator Elena Simonova-Bulat explaining treatment of panoramic photographs. Center for the History of Medicine, December 15, 2010. As a part of its Mellon-funded, University-wide photograph conservation effort over the past two years, the Weissman Preservation Center treated dozens of oversized photographs from the Boston Medical Library, Harvard Medical Library, and Brigham and Women’s Hospital collections. The turn-of-the-century images, which include photographs of the Boston Medical Library’s previous home on the Fenway, the Medical School quad, medical conference attendees, and groups of hospital staff members, suffered from a variety of problems, including silvering, tears and breaking, acidic backing, and dirt. Conservators temporarily removed the panoramas to the Weissman lab, where they were cleaned, re-backed, and rehoused, treatments that will extend the useful life of these rare images.